Create a one of a kind personalized gift. It’s fun and easy to design! Easter is just under three weeks away- isn’t that completely crazy?! I can’t believe it will be here so soon. You may be trying to come up with some fun ideas to serve-up on Easter. This is one of them. 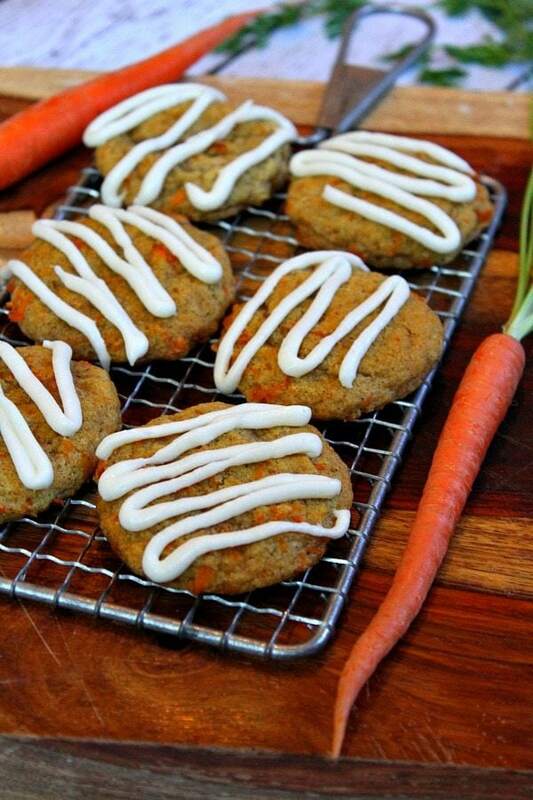 These are a soft spiced carrot cake cookie adorned with sweet cream cheese- white chocolate frosting. YUM! Here’s what you need for the cookies. Not a lot. 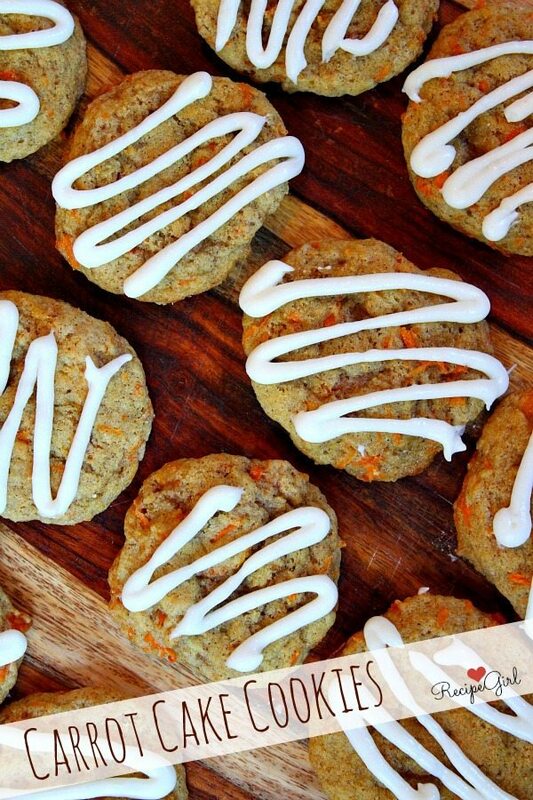 These are a simple cookie, and they are easy to make. 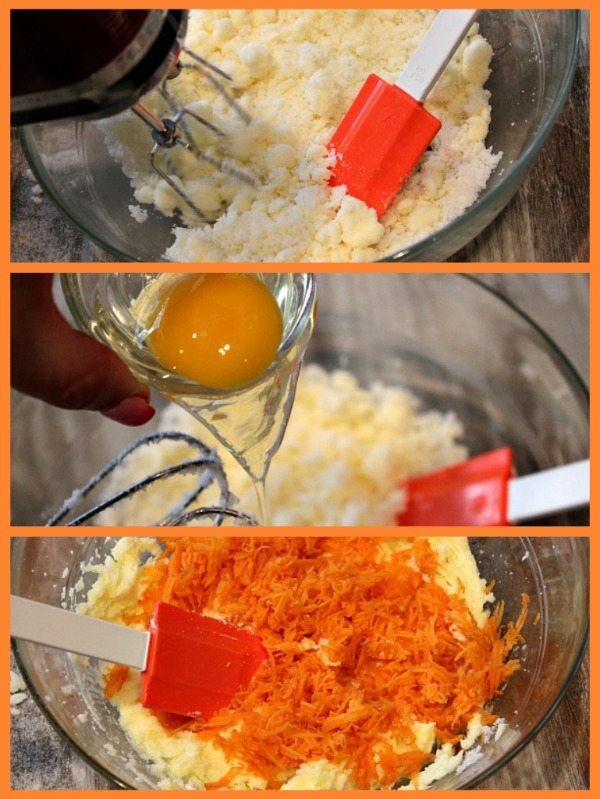 The process > mix butter and sugar, add the egg, then stir in the pretty orange carrots. Mix the dry ingredients [flour (Gold Medal is my flour of choice!) + spices] in a separate bowl. Sometimes I use a whisk to mix dry ingredients, but more often than not I turn a spoon upside-down and use the spoon handle to mix. Am I alone here? Anyone else do this? 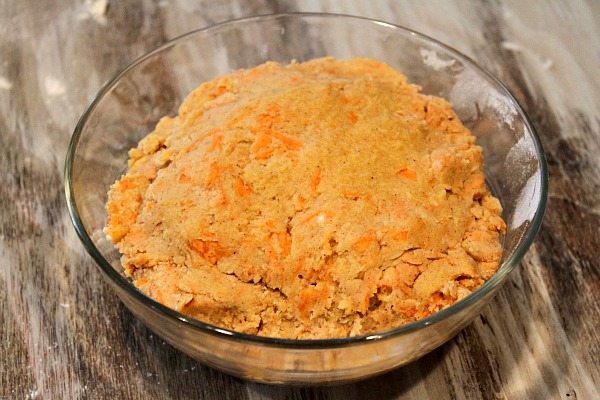 Add the dry ingredients to the wet ingredients, and here’s what you’ll have. The dough looks kind of funky at this point, but don’t worry… it will all be fabulous after you give it a quick chill in the refrigerator. 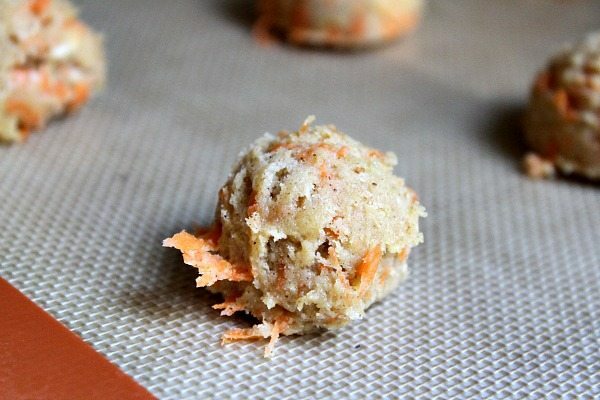 Scoop rounded spoonfuls of the dough and plop them on your baking sheets. I like to use a cookie scoop for this so I can get nice, round dollops that are all pretty darn even in size. Here’s what your cookies will look like when they come out of the oven. I love that the carrots peek out all over the place. 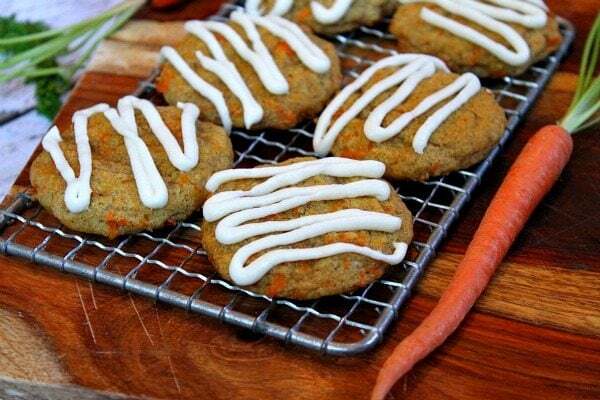 As sweet as that splash of carrot orange looks in the cookies, they’re much better when you add cream cheese frosting. 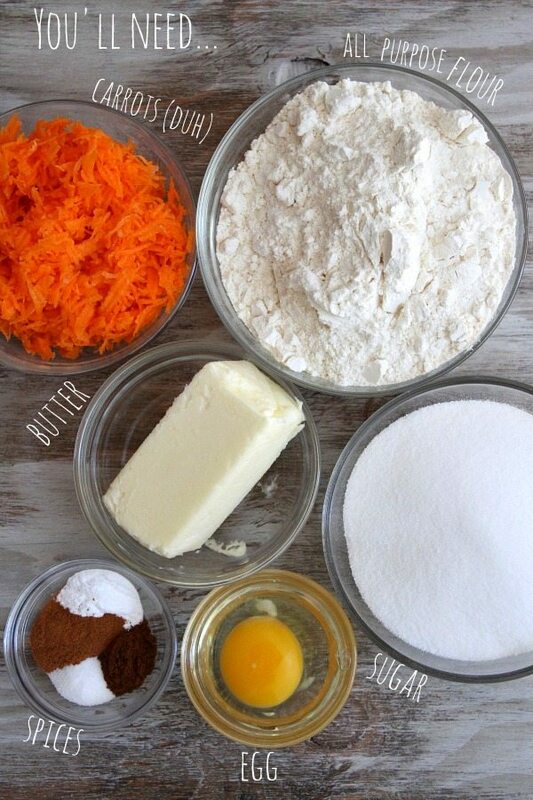 After all, that’s what makes a carrot cake, right? 1. Make the cookies: In a medium bowl, use an electric mixer to combine the butter and sugar until semi-smooth. Mix in the egg. Stir in the carrot. 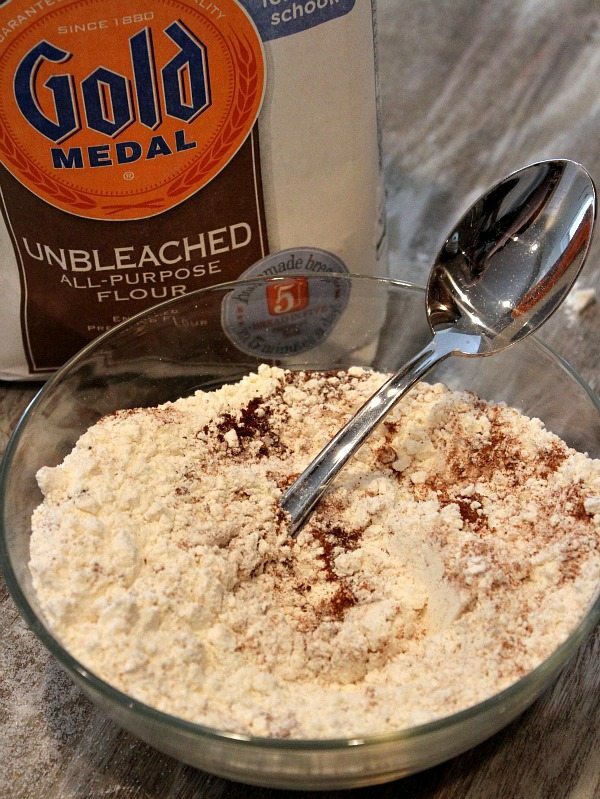 In a separate bowl, use a whisk to combine the flour, baking soda, cinnamon, cloves and salt. Stir the dry ingredients into the wet ingredients until well combined. Cover the bowl and refrigerate for at least one hour (or overnight). 2. Preheat the oven to 375 degrees. Line two baking sheets with parchment paper or silpat mats. Drop dough by rounded spoonfuls onto the lined baking sheets, spacing the cookies at least 2-inches apart. I like to use a cookie scoop for my dough so the baked cookies will turn out as round and perfect as possible. Bake 8 to 10 minutes, or until the cookies are baked through and set. 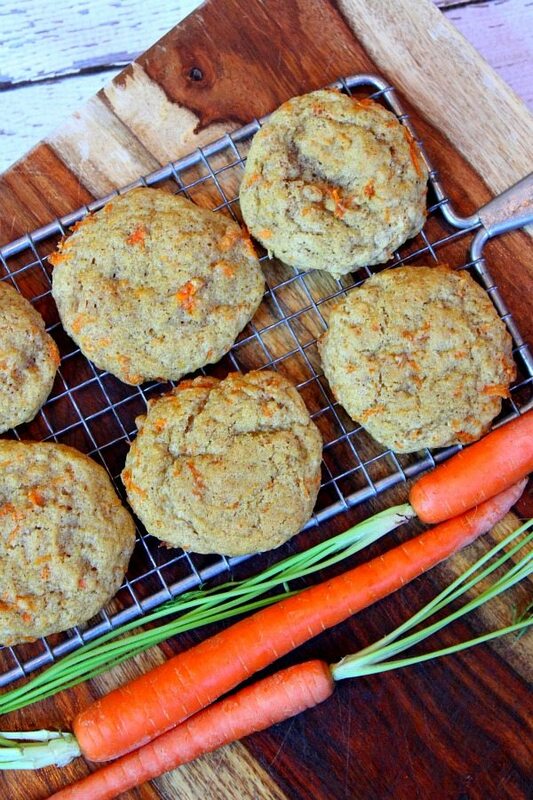 Let cool on the cookie sheets for 10 minutes before transferring them to a baking rack to cool completely. 3. Make the frosting: In a medium bowl, use an electric mixer to combine the cream cheese and butter. Mix until smooth. Mix in vanilla and melted chocolate. Mix in the powdered sugar, then add 1 tablespoon milk to thin out the mixture (add more milk or more powdered sugar, if needed). You want the frosting to be somewhat of a drizzling consistency (unless you’d prefer to spread the frosting on the cookies). Transfer the frosting to a zip baggie, cut a tiny hole in the corner of the baggies and squeeze the frosting into the corner to drizzle onto the cooled cookies. Let the frosting set- it might not set completely, so store them in a single layer. For freezing: Place a single layer of cookies in a container, stick it in the freezer until the cookies/frosting are firm. Place waxed paper on top of the cookies. Make a second layer of cookies and freeze again. Repeat until all of your cookies are in the container with layers of wax paper in between.